"FeH" redirects here. For other uses, see FeH (disambiguation). Iron(I) hydride is a chemical compound of iron and hydrogen with chemical formula FeH. It has been detected in isolation only in extreme environments, like trapped in frozen noble gases, in the atmosphere of cool stars, or as a gas at temperatures above the boiling point of iron. It is assumed to have three dangling valence bonds, and is therefore a free radical; its formula may be written FeH3• to emphasize this fact. At very low temperatures (below 10 K), FeH may form a complex with molecular hydrogen FeH·H2. 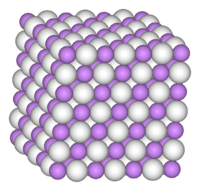 Iron(I) hydride is one of a few known compounds of iron and hydrogen, all equally rare; they also include iron dihydride (FeH2), stable only at very low temperatures, and a high-pressure iron-hydrogen alloy also with the formula FeH. 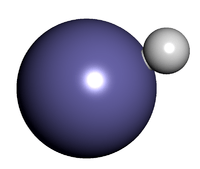 Iron(I) hydride was first detected in the laboratory by B. Kleman and L. Åkerlind in the 1950s. 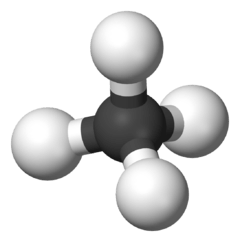 Iron hydride is one of the few molecules found in the Sun. Lines for FeH in the blue-green part of the solar spectrum were reported in 1972, including many absorption lines in 1972. Also sunspot umbras show up the Wing-Ford band prominently. Bands for FeH (and other hydrides of transition metals and alkaline earths) show up prominently in the emission spectra for M dwarfs and L dwarfs, the hottest kind of brown dwarf. For cooler T dwarfs, the bands for FeH do not appear, probably due to liquid iron clouds blocking the view of the atmosphere, and removing it from the gas phase of the atmosphere. For even cooler brown dwarfs (<1350 K), signals for FeH reappear, which is explained by the clouds having gaps. The explanation for the kind of stars that the FeH Wing-Ford band appears in, is that the temperature is around 3000 K and pressure is sufficient to have a large number of FeH molecules formed. Once the temperature reaches 4000 K as in a K dwarf the line is weaker due to more of the molecules being dissociated. In M giant red giants the gas pressure is too low for FeH to form. Elliptical and lenticular galaxies have also have an observable Wing-Ford band, due to a large amount of their light coming from M dwarfs. Kleman and Åkerlind first produced FeH in the laboratory by heating iron to 2600 K in a King-type furnace under a thin hydrogen atmosphere. Molecular FeH can also be obtained (together with FeH2 and other species) by vaporizing iron in an argon-hydrogen atmosphere and freezing the gas on a solid surface at about 10 K (-263 °C). The compound can be detected by infrared spectroscopy, and about half of it disappears when the sample is briefly warmed to 30 K. A variant technique uses pure hydrogen atmosphere condensed at 4 K.
This procedure also generates molecules that were thought to be FeH3 (ferric hydride) but were later assigned to an association of FeH and molecular hydrogen H2. Molecular FeH has been produced by the decay of 57Co embedded in solid hydrogen. Mössbauer spectroscopy revealed an isomer shift of 0.59 mm/s compared with metallic iron and quadrupole splitting of 2.4 mm/s. FeH can also be produced by the interaction of Iron pentacarbonyl vapour and atomic hydrogen in a microwave discharge. FeH is predicted to have a quartet and a sextet ground states. The FeH molecule has at least four low energy electronic states caused by the non bonding electron taking up positions in different orbitals: X4Δ, a6Δ b6Π, and c6Σ+. Higher energy states are termed B4Σ−, C4Φ, D4Σ+, E4Π, and F4Δ. Even higher levels are labelled G4Π and H4Δ from the quartet system, and d6Σ−, e6Π, f6Δ, and g6Φ. In the quartet states the inner quantum number J takes on values 1/2, 3/2, 5/2, and 7/2. FeH has an important absorption band (called the Wing-Ford band) in the near infrared with a band edge at 989.652 nm and a maximum absorption at 991 nm. It also has lines in the blue at 470 to 502.5 nm and in green from 520 to 540 nm. The small isotope shift of the deuterated FeD compared to FeH at this wavelength shows that the band is due to a (0,0) transition from the ground state, namely F4Δ—X4Δ. Various other bands exists in each part of the spectrum due to different vibrational transitions. The (1,0) band, also due to F4Δ—X4Δ transitions, is around 869.0 nm and the (2,0) band around 781.8 nm. Within each band there are a great number of lines. These are due to transition between different rotational states. The lines are grouped into subbands 4Δ7/2—4Δ7/2 (strongest) and 4Δ5/2—4Δ5/2, 4Δ3/2—4Δ3/2 and 4Δ1/2—4Δ1/2. The numbers like 7/2 are values for Ω the spin component. Each of these has two branches P and R, and some have a Q branch. Within each there is what is called Λ splitting that results in a lower energy lines (designated "a") and higher energy lines (called "b"). For each of these there is a series of spectral lines dependent on J, the rotational quantum number, starting from 3.5 and going up in steps of 1. How high J gets depends on the temperature. In addition there are 12 satellite branches 4Δ7/2—4Δ5/2, 4Δ5/2—4Δ3/2, 4Δ3/2—4Δ1/2, 4Δ5/2—4Δ7/2, 4Δ3/2—4Δ5/2 and 4Δ1/2—4Δ3/2 with P and R branches. Some lines are magnetically sensitive, such as 994.813 and 995.825 nm. They are broadened by the Zeeman effect yet others in the same band are insensitive to magnetic fields like 994.911 and 995.677 nm. There are 222 lines in the (0-0) band spectrum. 1 2 Carroll, P. K.; P. McCormack (1 October 1972). "The Spectrum of FeH: Laboratory and Solar Identification". Astrophysical Journal Letters. 177: L33–L36. Bibcode:1972ApJ...177L..33C. doi:10.1086/181047. 1 2 3 4 Schiavon, Ricardo P.; B. Barbuy; Patan D. Singh (20 July 1997). "The FeH Wing-Ford Band in Spectra of M Stars". The Astrophysical Journal. The American Astronomical Society. 484: 499–510. arXiv:astro-ph/9701186 . Bibcode:1997ApJ...484..499S. doi:10.1086/304332. ↑ Cowen, Ron (4 July 1998). "So cool, and some are still stars". Science News. ↑ Burgasser, Adam J.; Mark S. Marley; Andrew S. Ackerman; Didier Saumon; Katharina Lodders; Conard C. Dahn; Hugh C. Harris; J. Davy Kirkpatrick (1 June 2002). "Evidence of cloud disruption in the L/T dwarf transition" (PDF). The Astrophysical Journal. 571 (2): L151–L154. arXiv:astro-ph/0205051 . Bibcode:2002ApJ...571L.151B. doi:10.1086/341343. 1 2 Nordh, H. L.; Lindgren, B.; Wing, R. F. (April 1977). "A proposed identification of FeH in the spectra of M dwarfs and S stars". Astronomy and Astrophysics. 56 (1–2): 1–6. Bibcode:1977A&A....56....1N. Retrieved 21 April 2012. ↑ Andrews, Lester (30 January 2004). "Matrix infrared spectra and density functional calculations of transition metal hydrides and dihydrogen complexes". Chemical Society Reviews. 33 (2): 123–132. doi:10.1039/B210547K. PMID 14767507. Retrieved 2 February 2013. ↑ Pasternak, M.; Van Der Heyden, M.; Langouche, G. (February 1984). "The characterization of FeH molecules by Mössbauer spectroscopy". Chemical Physics Letters. 104 (4): 398–400. Bibcode:1984CPL...104..398P. doi:10.1016/0009-2614(84)80087-1. ↑ Brown, John M.; Körsgen, Helga; Beaton, Stuart P.; Evenson, Kenneth M. (2006). "The rotational and fine-structure spectrum of FeH, studied by far-infrared laser magnetic resonance". The Journal of Chemical Physics. American Institute of Physics. 124 (23): 234309. Bibcode:2006JChPh.124w4309B. doi:10.1063/1.2198843. 1 2 Hullah, Daniel F.; Burrow, Richard F.; Brown, John M. (September 1999). "Low-lying energy levels of the FeH molecule". Molecular Physics. 97 (1–2): 93–103. doi:10.1080/00268979909482812. ↑ Goodridge, Damian M.; Daniel F. Hullah; John M. Brown (8 January 1998). "Rotational analysis and assignment of the 630 nm band system of FeH to the e 6Π–c 6Σ1 transition". Journal of Chemical Physics. 108 (2): 428–435. Bibcode:1998JChPh.108..428G. doi:10.1063/1.475404. 1 2 Ram, R. S.; Bernath, P. F.; Davis, S. P. (10 May 1996). "Fourier Transform Emission Spectroscopy of the g4Δ–a4Δ System of FeF" (PDF). Journal of Molecular Spectroscopy. 179 (2): 297. Bibcode:1996JMoSp.179..282R. doi:10.1006/jmsp.1996.0207. 1 2 Phillips, J. G.; Davis, S. P.; Lindgren, B.; Balfour, W. J. (December 1987). "The near-infrared spectrum of the FeH molecule". Astrophysical Journal Supplement Series. 65: 721–778. Bibcode:1987ApJS...65..721P. doi:10.1086/191241. ISSN 0067-0049. ↑ Reiners, A.; Schmitt, J. H. M. M.; Liefke, C. (2007). "Rapid magnetic flux variability on the flare star CN Leonis" (PDF). Astronomy and Astrophysics. 466 (2): L13–L16. arXiv:astro-ph/0703172 . Bibcode:2007A&A...466L..13R. doi:10.1051/0004-6361:20077095. ↑ John S. Mulchaey (February 1989). "The Rotational Temperature of the FeH Molecule in a Sunspot". Publications of the Astronomical Society of the Pacific. The University of Chicago Press. 101 (636): 211–214. Bibcode:1989PASP..101..211M. doi:10.1086/132424. JSTOR 40679297.